Some students of Chukwuemeka Odumegwu Ojukwu University, COOU, formerly Anambra State University, have taken to social media to disclose that one of their lecturers gave them free textbooks for his lecture. The students who are of the department of mass communication, 200 level, expressed surprise at the action of their lecturer, saying they never believed a lecturer could do such a thing. Massmediang gathered that the lecturer had noticed that the students did not resume school immediately after the nationwide strike by university lecturers, so he devised a means to get them back to school. 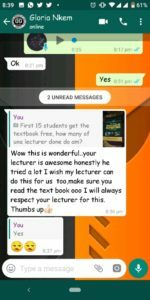 He then sent a message to the whatsapp group of the class telling them that the first set of students to appear in class will get his textbook free of charge. The textbook is actually sold N1,500 in the University bookshop. In the end, 80 percent of the class got the textbook free. The lecturer told the students that what he gave them was one of his best textbooks but insisted that anyone who failed to come to class with the free textbook will be walked out. Two of the students actually forgot to come to class with theirs for the next lecture after receiving the free gift. Below are some of the comments the students posted on social media.